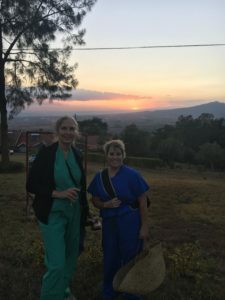 I had always wanted to go on medical mission trips. It was a dream that began when I was in medical school. But, practicing medicine and raising a family seemed to take all the time and energy that I had. Finally, in 2008, I thought the kids were old enough and I jumped at the opportunity to travel to Mexico with a multi-specialty medical group. We set up a MASH like makeshift hospital in a school up in the mountains of Puebla Mexico and set to work. We had three operating tables and three surgical teams and three patients in one room– and we performed hundreds of operations in a two week period that summer. I was hooked! I loved the instinctive, basic interaction between patient and doctor with no concern for payment, insurance, copays or preauthorization. It was back to the basics of matching someone with a medical need and someone with the skill to fill that need. Well, okay, there is that other thing–also, I love to travel. Since that first trip in 2008, I’ve had many amazing opportunities to travel to Zambia, Kenya and Ecuador on cleft lip and palate trips once or twice a year. I’ve met some absolutely incredible people–parents and guardians who will ride buses from hundreds of miles away, or walk for hours to seek help for their precious children. Children, hundreds of children named Blessing, Tuesday, Elvis, Joy, Beauty, Hope…I’ve met many skilled surgeons, anesthetists, nurses, speech therapists who are willing to give up their vacation time and spend their hard earned money to go sleep on hard cots, take cold showers, slather on DEET, eat delicious and sometimes not so delicious foods, get a bunch of vaccines, risk traveler’s diarrhea…and love it. There really is nothing like seeing a mother’s face when she first sees her child after a cleft lip repair. Really. Nothing like it. So, here we are in 2018. 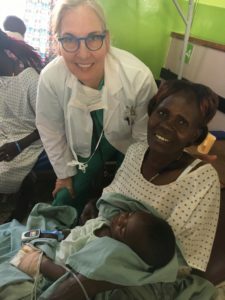 My dream with Global Medical and Surgical Teams is to offer the framework and support for others to fulfill their dreams of helping those in need, one operation at a time, one smile at a time, one trip at a time. For now, we’re focusing on cleft lip and palate surgery. But. Here’s the catch–it is also about teaching. Teaching each other and teaching our hosts and learning from our hosts. My observation over these last ten years is that we need to encourage sustainable medical care. Many areas of the world do not have adequate numbers of medical professions to provide even the most basic of medical care, much less specialized surgical procedures. I want to be part of the solution–to get to the point where each country has the infrastructure and adequate numbers of well-trained medical professionals to care for their own citizens. So, to me, the teaching is just as important as the surgery. I’m so committed to this idea that I am earning my MPH through Johns Hopkins in my spare time. Public Health has a mantra of saving millions of lives at a time. Surgery saves one life or gives one smile at a time. The two approaches are very different but equally important. The time is now to work together, through teaching, surgery and public health to allow all people access to life saving and life changing medical and surgical care. 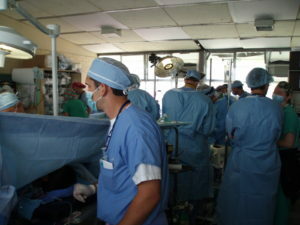 Please support Global Medical and Surgical Teams as we strive to be part of the solution. P.S. There are so many people that are working and volunteering to make this dream become a reality. Check out our About page to read about our gifted and selfless board members. Check out our Uganda Team page to see who is traveling with us this spring–wow! What a gifted bunch of folks! And finally, check out our Donate page to see how you can help. Michelle, what an amazing way to use your talents to make the world a better place. Thank you. What a WONDERFUL mission, congratulations! Global Medical and Surgical Teams is a registered 501(c)3 nonprofit organization.